Anyway, there IS one big recent announcement regarding the markets that you should be aware of. It's a major development for the U.S. stock market. The options experts at Options University are all over this and have recorded a special trading video that reveals the importance of this recent development. Watch this 11-minute trading video now. Every other trader will eventually understand the importance of this development, so the earlier you understand it, the better. The BIGGEST and most EXCITING trend to hit the markets in decades – courtesy of the NASDAQ! CLICK to See the Video NOW! Do you like change? Or are you comfy the way things are. It should either get you really excited... or, it should frustrate the heck out of you because of this upcoming change to the stock market. Regardless of how you feel, this change could have a profound impact on how you trade. "Stock traders are up in arms, fuming mad at NASDAQ's latest announcement regarding options -- and what it all means to the stock market and your trading (HINT: you may never trade stock again...)." A trading range is basically a horizontal channel in which a security moves from the high and low of the channel for an extended amount of time. Obviously, the upper level of the range can be considered resistance and the lower level represents support. Trading within a range is possible, but it's the breakout from the range that provides the best opportunities. ABT has formed a huge saucer top pattern, which is highly bearish. The stock is holding right at the lip (support) of the pattern at 45.90 which, if broken, could spark heavy selling. GIGM has trended steadily higher for some time now, but could finally be over-extended. The stock got a big, bearish exhaustion gap today and is winding up within a large triangle range. A downside break through 9.00 could be huge for sellers. Updated Thursday, 11/9 for Friday's market. - Dow pushes steadily lower throughout session, holds at key 12,100. The index index trailed lower to the Close and eventually closed the day at the key 12,100 zone with a 73 point loss. - The NASDAQ and S&P each fell from the day's highs today, but basically held firmly above key near-term support. Watch these support levels tomorrow. The Dow ended the day precisely at the 12,100 level today after it steadily declined throughout the session. The index continues to pull-back from the 12,200 resistance level, which could cause a longer retracement, especially if 12,050 is violated. PEIX has wound up perfectly within the boundaries of a solid triangle pattern. The stock is now testing the upper trend line of the pattern at 17.50 and could get a huge upside break and rally. Watch this pattern closely. WPI has gotten a big breakaway gap from a tight consolidation at 25.60, which is quite bearish. Look for continued weakness from this stock. Updated Wednesday, 11/8 for Thursday's market. - Dow reverses from major trend line, rallies steadily to the Close. The index proceeded to push higher the remainder of the day and eventually closed at another record high at 12,176, which was good for a 20 point gain. The index continues to struggle at 12,200, however, which is the next big level to watch for strength. - The NASDAQ and S&P each rallied from early lows this morning, but failed to advance above key resistance. Watch the ranges that have formed for the next medium term move. The Dow closed the day near the highs of the day to set another record high. However, the 12,200 level continues to hinder further strength. Watch this level for key breakout movement; otherwise, 12,100 could be tested again. Introduced by Roger Altman in the February 1993 issue of Technical Analysis of Stocks & Commodities magazine, the Relative Momentum Index is a variation of the Relative Strength Index (RSI). Instead of counting up and down days from close to close like the RSI, the Relative Momentum Index counts up and down days from the close relative to a close n-days ago (where n is not limited to 1 as required by the RSI). As with all overbought/oversold indicators, the RMI exhibits similiar strengths and weaknesses. In strong trending markets the RMI will remain at overbought or oversold levels for an extended period. In non-trending markets the RMI tends to predictably oscillate between an overbought level of 70 to 90 and an oversold level of 10 to 30. When the RSI diverges from the price, the price will eventually correct to the direction of the index. OMNI is winding up within a large triangle range, which has developed over the last three months. Look for a breakout from this range for big movement: 10.50 up and 8.60 down. HW has gotten a huge downside break from a clear triangle range at 24.00, which is highly bearish. Look for continued overall weakness from this pattern. Updated Tuesday, 11/7 for Wednesday's market. - Dow reverses from major trend line, rallies steadily to the Close. The index proceeded to trade sideways the remainder of the session and is now holding just beneath key resistance at 12,200. - The NASDAQ and S&P each rallied to early gains this morning, but fizzled a bit to the Close. Each remains bullish after the current two-day advance, but could be in a consolidation mode before another breakout is seen. The Dow ended the day near the highs of the session after halting its advance at 12,200. The index is now consolidating at the highs, which may persist ahead of the next move. The index should remain near-term bullish above 12,100. FRNT has formed a tightly-wound triangle consolidation at the highs of the overall advance. Watch for a breakout from this range for key movement: 8.50 up, and 7.80 down. AVP has reversed from major resistance at 33.25, which has held firmly since May. Look for a steady decline from this level, unless resistance is crossed and held. Updated Monday, 11/6 for Tuesday's market. - Dow reverses from major trend line, rallies steadily to the Close. The major lower trend line, seen in the Daily and 60 Minute Charts continues to be a major force in the highly bullish uptrend, which will remain the 'norm' as long as it remains in tact. - The NASDAQ and S&P each rallied solidly today, but looked to have tapered off to the Close. Look for each to hold gains tomorrow, as long as intraday support levels remain in tact. The Dow closed the day with a solid gain after rallying fiercely at the Open and maintaining the gains to the Close. The index will likely look to hold gains tomorrow, as a potential continuation pattern forms. Look for continued overall strength above 12,050, unless this level is violated. ERTS took a large gap up through major resistance at 58.00 today, and also has increased volume. If the stock can continue to hold above the break zone of 57.80, we could see much more strength ahead. IRF has broken a large consolidation to the upside via a solid breakaway gap and increased volume, which is quite bullish. Watch for continued strength from this stock. 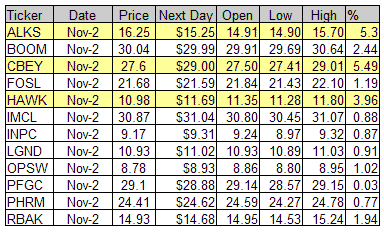 Updated Friday, 11/3 for Monday's market. - Dow continues slow decline, pull backs to major lower trend line. The pull-back continued today and resulted in a 33 point loss in the Dow, but the index has finally reached the major lower trend line at 11,950, which will be the zone to watch next week. - The NASDAQ and S&P continued their respective declines today, but look to be gearing up for an even larger move next week. Watch support for signs of continued overall weakness. The Dow closed the day with another loss today, extending its streak to six days in a row. The index continues to look fairly unorganized in its movement, but has traded precisely to the major lower trend line at 11,950, which we will continue to watch. A break or bounce from this level will likely determine the next major medium term move.